The protection for free speech was largely motivated to safeguard the preaching of the Bible. Several passages in the Bible, both Old Testament and New Testament, support a right of free speech, including Numbers 11:26-30 (Moses allowed free speech by declaring, "If only all the people of the LORD were prophets! "); Mark 9:38-41 (admonition by Jesus not to stop strangers who cast out evil in his name). A group of colonial leaders known as the Anti-Federalists expressed concern that the Constitution contained no guarantee of individual liberties, and they pressed for the document to be amended. Their insistence led to the creation of the Bill of Rights by James Madison in 1791. Madison was the principal author of the Bill of Rights, including the First Amendment. Liberals often focus on the "Establishment Clause", arguing that because the federal government cannot endorse or establish a religion, the state must remain neutral, or even hostile towards religion. This position is not supported by the original intent and application of the Constitution. Michael Farris argues that the Establishment Clause should not apply to the states because it is a jurisdictional limit on federal power, rather than a protection of rights incorporated by either the Due Process Clause or Privileges or Immunities Clause of the Fourteenth Amendment. However, liberals often overlook the clause explicitly allowing for the free exercise of religion, also known as the Free Exercise Clause. 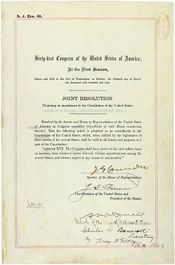 Conservatives argue that this clause can be interpreted to allow much more leeway to the majority of religious Americans than liberals currently allow, and that it provides legislators with great flexibility in supporting the ends of Christian faith, as long as all other religious denominations are equally supported. The fact that Congress may pass no law establishing or respecting a particular Christian denomination provides the federal government with the freedom to support a variety of Christian ventures, notably the faith-based initiatives enacted under President Bush. American liberals have attempted to use the so-called Fairness Doctrine and political correctness in order to silence conservative viewpoints. These ideologically-motivated attempts to limit free speech are in direct violation of the First Amendment, specifically, and, by extension, the entire U.S. Constitution. Many liberals also believe in "hate speech" laws, which allow the government to silence "offensive" views, including criticism of the homosexual agenda, "racist" speech (often defined broadly to include opposition to mass immigration) and "Islamophobia." ↑ NAB version quoted above. This page was last modified on 1 January 2019, at 23:07. This page has been accessed 49,365 times.